Soviet Propaganda Poster - Soldier striking the US generals holding an atom bomb with red rocket. Unfortunately, your registration has been declined by the auctioneer. You can contact the auctioneer on +44 207 352 9309 for more information. You are the current highest bidder! To be sure to win, log in for the live auction broadcast on 22 Apr 2017 15:00 BST or increase your max bid. 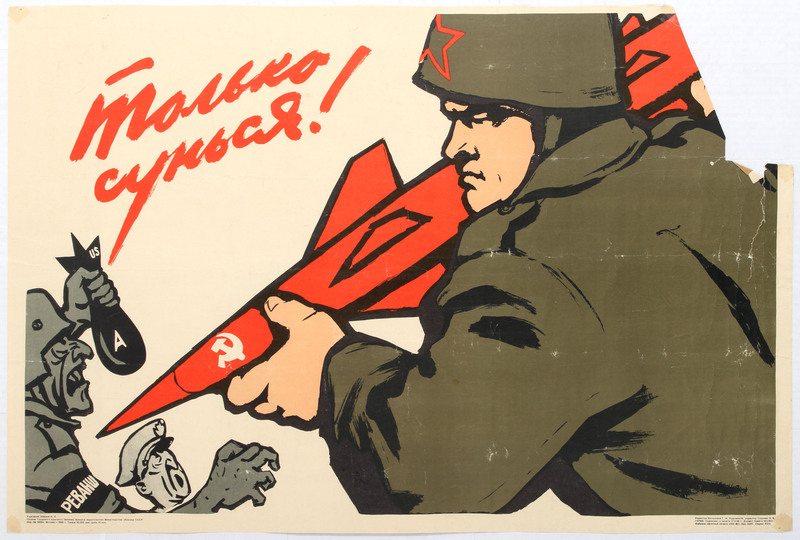 Soviet Propaganda Poster - Soldier striking the US generals holding an atom bomb with red rocket. Caption - Just you try it. Country: Russia. Year: 1968. Artist: V. Ivanov. Size (cm): 56x83.5 (Horizontal). . Fair condition, mssing paper on top right corner, tears on right margin, folds, creases. Buyer Pays Shipping Cost and import duties. We offer worldwide shipping, payment on collection is possible. We ship posters worldwide rolled in shock-resistant and hard wearing tubes. We use Royal Mail special delivery with insurance for postage in the UK and signed and tracked service where available with a maximum insurance of £250 for international shipments. Over-sized posters (over 80cm) are shipped by UPS. Guaranteed authentic Advertising, sport, travel, film, ski, propaganda and war original vintage posters from around the world. AntikBar Limited offers an online bidding service via the-saleroom.com for bidders that register on this bidding platform. 2. confirm that you are authorised to provide these credit card details to AntikBar Limited through www.the-saleroom.com and agree that AntikBar Limited are entitled to ship the goods to the card holder name and card holder address provided in fulfilment of the sale. All sales are final, items are as described. Please send us requests for more information if needed. We will provide you quotes for worldwide shipping, no returns, buyer is responsible for customs clearance and payment of customs fees. Ownership of goods passes to buyer once the items are picked up by a shipper or taken in by the Post Office, we do not assume responsibility for goods in transit. Payment is required within 7 days after auction. Payment in Pounds (GBP) is possible on collection in London and Moscow (by special arrangement). Auctioneer reserves the right to sell the lots for which the payment was not completed. Auctioneer reserves the right to sell the lots for which the payment was not completed.